Petro Pavlovych was born in Kyiv in the family of the teacher of the Kyiv Polytechnic Institute. Somehow, he showed the ability to exact sciences, in 1933 he entered the Kyiv Polytechnic, and in 1938 he graduated from the Faculty of Electrical Engineering, received a diploma of an electrical engineer with honors. From November 1938 to February 1941 he served in the army. During the Finnish campaign, a young engineer was involved in the construction of electrification facilities on the Karelian Isthmus. In December 1939, he was enrolled in short-term courses on the training of commanders of the middle officers. After the accelerated release in March of next year, the young lieutenant got the appointment as an electrical platoon commander in the 43rd Special Engineer Battalion of the 8th Special Forces Brigade. After demobilization from February to June 1941, P.P. Ornatskyi worked as a design engineer at the “Tochelectroprylad” plant in Kyiv. Petro Pavlovych take part in the Great war from the first day to the last. He needed the experience of building engineering structures in 1941 near Kyiv, when Nazi aircraft destroyed the first and second line of defense of the city. Since then, as part of the 9th Separate Battalion of the 4th Air Reconnaissance Regiment, the alert and communication of the future scientist has gone the way of war, which he finished in the rank of captain as deputy chief of staff of the regiment, which was part of the 1st Ukrainian Front. Participation of P.P.Ornatskyi in battles was marked by 10 military awards, among which are the Order of the Red Star and the Great War of the 1st degree. To the 40th anniversary of the Victory in 1985 P.P. Ornatskyi received a thanks from the Minister of Higher and Secondary Education of Ukraine for his participation in the defense of the Motherland during the war years and active participation in further education and upbringing of youth. After demobilization from November 1945 to 1949, he studied at the post-graduate course of the Kyiv Polytechnic Institute. In June 1949 he defended his Ph.D. thesis on the topic “Investigation of various schemes of electronic-tubes wattmeters and detector phasometers”. He worked as associate professor of the department of measuring equipment, and since September 1956 headed this department, which later became the chair of information and measuring technology. The formation and development of P.P.Onatskyi as a scientist and a teacher was related to the development of the Department of Information and Measuring Technology in the KPI, instrument making in Kyiv and in general in Ukraine. In 1956 P.P.Ornatskyi received the academic title of the professor, and in 1967 he defended his dissertation and received a doctorate in technical sciences. During his time at the Institute, Professor P.P.Ornatskyi devoted a great deal of energy to the creation and development of educational and scientific areas of the department and specialty, the formation of a national school of metrologists and instrument builders, one of which leaders he was. His scientific works in the field of electrical measuring equipment were introduced in the means of measuring equipment, which were serially manufactured by domestic industry. On the basis of the scientific work of Professor P.P.Onatskyi and his students in cooperation with a number of instrument making factories of Kyiv, Zhytomyr, Tallinn, Omsk there was introduced into mass production of more than ten types of digital and analog measuring instruments and converters. P.P. Ornatskyi with his teacher, Corr. Academy of Sciences of Ukraine, prof. A.D. Nesterenko issued a manual “Parts and Nodes of Instruments”, which was reprinted four times in Russian in 1958-1966 and once in Estonian. For 10 years he has been used to prepare engineer-designers of measuring equipment. The structural approach to measuring instruments was generalized in P.P.Onatskyi's book “Automatic measurements and analog and digital devices”, which was published in 1965, 1971 and 1973, and twice in Hungarian. In 1973 P.P.Ornatskyi received the State Prize of the Ukrainian SSR for the creation of this textbook. In the book “Automatic measurements and analog and digital devices” an analysis of the development of structures of analog and digital measuring devices was carried out, and the role of domestic scientists in the development of instrument making was reflected. The book has a unique approach to the analysis of analog and digital measuring devices. At that time it was the first textbook on digital measuring instruments, in which the most complete analysis of modern measuring instruments at the time was presented. In 1983, a textbook by P.P.Onatskyi's “Theoretical Foundations of Information and Measurement Technology” was published, in which the basic notions of information-measuring technique were systematized and students of specialties related to information and measuring equipment were studying for many years, and specialists whose activities were related to measurements. Professor P.P.Ornatskyi created a scientific school of theoretical and experimental informatics. Author of more than 200 scientific works. Among his pupils – 6 doctors and 85 candidates of sciences. Under his leadership, many research and development projects have been implemented and realized, the level of which has been recognized as a global one. The youth, held in the war, hardened Petro Pavlovych. When there were difficulties in work or complicated domestic moments, he liked to repeat: “I am an old soldier”. The scientist took an active part in many scientific and technical forums of various levels, since 1967 he was a member of the Subcommittee on Higher Education in the field of measuring techniques of the International Congress on Measures (IMECO). He chaired the IMECO Technical Committee on Higher Education. His reports on the fundamental definitions of metrology and the peculiarities of training specialists in metrology and measuring techniques are known. For many years Petro Pavlovych headed the author's team working on the creation of the Ukrainian Encyclopedia of Measurement and Control, as well as the Russian-Ukrainian Dictionary of Metrological Terminology. The preparation of these editions was accompanied by a peculiar synthesis of the linguistic, terminological and methodological unity of approaches to the basic concepts of metrology, which developed for a quarter century in the field of measurement. The main provisions of these approaches, as well as the basic relationships of measurements with methods of cognition and experimental informatics, are described in the textbook titled “Introduction to the Methodology of the Science of Measurement” (1994). After Ukraine gained independence, work was started on the creation of the State Standards of Ukraine in various fields of science and technology. P.P.Onatytskyi headed the author's team on the creation of the State Standard of Ukraine “Metrology. Terms and Definitions”, the work of which was completed in 1994 and which came into force on 01.09.1995 under the number of DSTU 2681-94. After that, work was begun on the creation of the State Standard of Ukraine “Electronic Measuring Instruments for Electrical and Magnets, Timing for their Determination”. Until the last days, Petro Pavlovych continued to work on this standard, but in January 1996 it did not become. Petro Pavlovych's students finished this work, and the standard came into force on 01.01.1998 under the number of DSTU 3540-97. 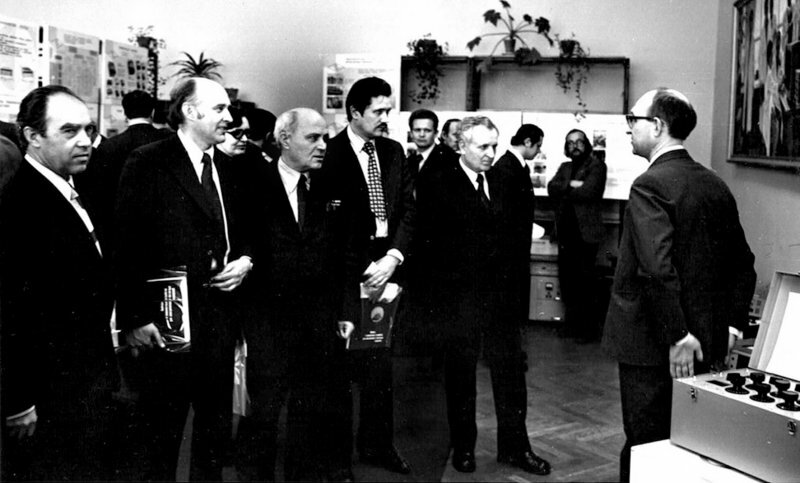 The scientific work of Professor P.P.Ornatskyi was awarded with several government awards, in particular the Orders of Lenin and the Labor Red Banner. Petro Pavlovich was a sensitive, friendly person, it was a pleasure to work with him. Young people were treated with attention and respect, despite his high authority. They always went for advice to him, graduates remember that he treated them “in a paternal manner”. And we remember P.P.Onatskyi with gratitude for the help and guidance that we needed later as a wise teacher, which is an example of devoted work and constant self-improvement for us.